Today’s the day that as Americans we gather around dining tables and gorge upon delectables and rich savories from traditions famously fashioned in the oils of Rockwell and Leyendecker. As carving knives sharpen and mouths salivate in anticipation the mind wanders, it’s catalyst a great bird and former title challenger of national symbol. The Turkey whose ancient blood lines are from creatures of a much greater stature, some even kings within their own niches. It’s kind of sad to think that the most powerful of creatures to have ever walked the earth have been reduced to a celebratory meal on the third Thursday of Novembers. No wonder dinosaurs always eat people in the movies. Happy Thanksgiving everyone. If you’re sitting around with nothing to do, waiting on cooking timers and fashionably late family arrivals, well the ol’ Taddman has got your buns covered (Taddman was what I was called as kid, I’m just trying it out… it could work). 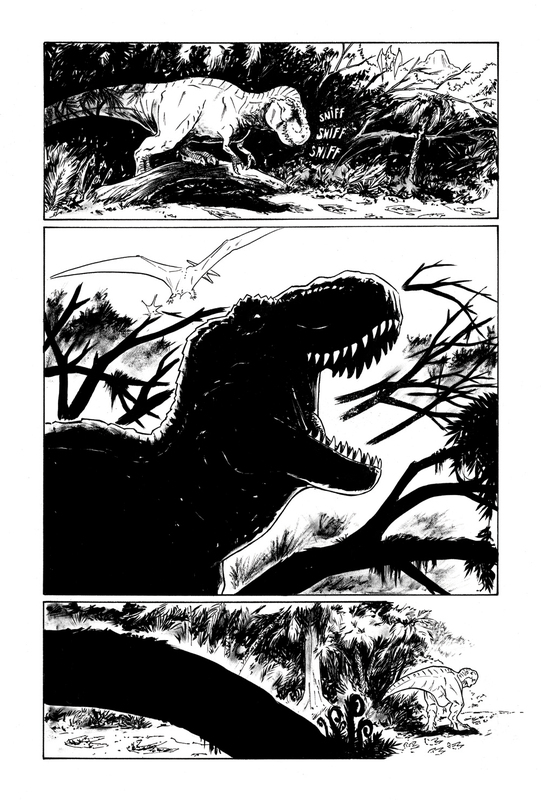 Right now you can read an advanced viewing of my long time in the makings graphic novel, Cretaceous, over at Net Galley. The Oni Press book won’t be released in print until March 26, so if you can’t wait another 5 months, it’s there waiting for you. That is if you’ve got some time on your hands and you don’t mind writing a kind review (I really would appreciate a 5 star review). Oh, that’s right! Cretaceous is wrapped and done, son! And I honestly can’t wait for everyone to see it. So if you’re a dinosaur kid or your kids and are… dinosaur kids check it out at over at Net Galley. Heck, if you’re going: “Tadd! I can handle the wait for that sweet stack of comic pages, but I’m ready to pull that trigger now!” Well because I love you and all that positive energy you’re putting into the universe toward Cretaceous pre-orders are available. Right now I’m enjoying or trying to enjoy a bit of R&R and am thinking of all the things I’m grateful and thankful for (What’s happening? Why are we getting serious all of a sudden!?). When I come back I’ve got a few red hot irons that are just about ready to be pulled out of the fire. I hope everyone enjoys some peace today and fill that body with friendly vibes and wonderful food stuffs. Gnar the thankful turkey pig.